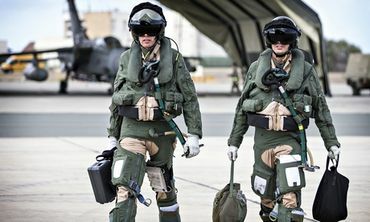 RAF jets were unleashed above Iraq on Saturday as Britain threw its military might behind a US-led air war against the rampant Islamic State (Isis) terror group. We're recruiting moderate Muslims to turn them into radical Muslims so they can fight against the other ones we turned into radical Muslims to fight against....well, you get the picture--round and round we go, and there's no getting off this train of the insane. The UK joining in the madness? But of course. They're apparently not going to violate International Law by bombing Syria, but they're helping enable the U.S. and others to do that, so it's basically a difference with little distinction. Go get em boys, kick their butts to kingdom come! More bombs and more destruction and more civilian deaths to add to the rising toll. Never mind the invasion of Iraq itself was illegal and now more countries added conveniently for our regime change in Syria agenda and extension of the war beyond border bordering on insanity.. Noted. Thanks, Carrie. I agree with the comments made by Bruce & Wild above. It seems the U.S. continues to be above the law. Yes, we are fighting those who now are armed with our own weaponry. Somebody's really happy to just produce some more, though! Money talks. Who do you think makes the law? Great news thanks Carrie. I hope they bomb the crap out of them. That's what they deserve. We don't need these cretins on planet earth. Good,one more partner against Daesh,airpower alone will not solve this fight,whatever we believe boots on the ground and diplomacy is the only way to end Daesh. I agree with Scooby & Stan! Like Natasha said it would be great knowing they were blown to bits! Wow, amazing how a rather factual article like this can bring out the best in some Care2 members and the worst in some others.